Few know that Kolkata once had a large Armenian community that has dwindled over time. It is from the stories told by my Armenian friends in the city that I learnt that their homeland was the first country to adopt Christianity as the state religion in 301 AD. They described visions of Armenia’s churches that became imprinted in my mind. Visions of sprawling, majestic complexes, nestled in the folds of green canyons and hilltops, that have borne testimony to the creative power of one of the world’s oldest civilizations. A grant from Luminous Landscape, a web portal for photography education, took me to the country on a two-week project. I was surprised to discover apostolic complexes that have been immaculately preserved. Their beauty is quite unlike that of the Christian churches I’ve seen across Europe, that have ornate frescoes and heavily decorated interiors. The churches I saw in Armenia had unique motifs like stone lions and khachkars, intricately carved stone slabs with exquisite motifs. I encountered numerous legends, the most interesting perhaps being that of the Geghard monastery, where the Holy Lance with which Jesus Christ is said to have been pierced was found; or of the Khor Virap monastery near the Turko-Armenian border, where Saint Gregory, the patron saint of Armenia, was imprisoned in a dungeon for 13 years. Visitors can go down to the dungeon from where the saint convinced the king holding him to adopt Christianity and became his religious mentor. These churches and monasteries that bear references to biblical incidents and early Christian history are an integral part of modern Armenia, despite 70 years of Soviet rule (which ended in 1991). Visitors can still witness traditional wedding ceremonies in the semi darkness of these 1,000-year-old structures, resonant with the mellifluous notes of the duduk, an ancient woodwind instrument that remains one of the symbols of Armenian identity. Khor Virap monastery, located close to Armenia’s border with Turkey, is the country’s most important and most visited religious site. In was here, at the foothill of the biblical Mount Arafat, that Saint Gregory was imprisoned in a dungeon below the main chapel for 13 years, and where the process of Armenia becoming a Christian nation began. The ruins of the Zvartnots cathedral, built in the seventh century, reveal Syrian and Mesopotamian influences. Located 20km from the capital city of Yerevan, at 45m, it was one of the tallest structures in the world till it remained standing until the end of the 10th century. A Unesco World Heritage site, Geghard monastery is partially carved out of the adjacent cliff. Its cavernous inner chambers are full of inscriptions and elaborate carvings. Tucked deep inside the Dilijan National Park near Armenia’s north-eastern border, Haghartsin is one of the most picturesque church complexes of Armenia. It was built between the 10th and 13th centuries. 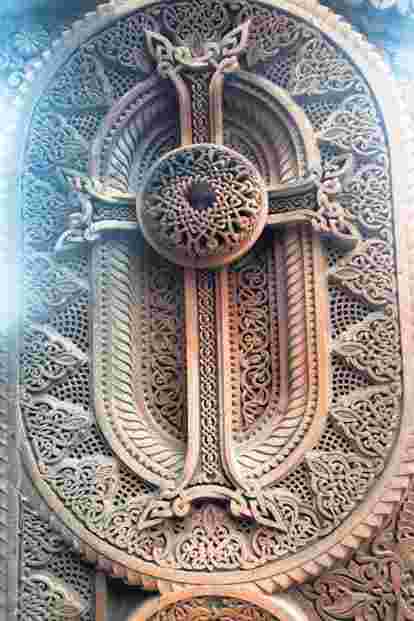 The carved Armenian cross-stone, known as a khachkar, is a memorial stone with exquisitely detailed motifs. Since 2010, khachkars, their symbolism and craftsmanship are inscribed in the Unesco List of Intangible Cultural Heritage. Sevanavank monastery is located on the bank of Lake Sevan, the largest water body in the Caucasus. It was built in 874 AD, at a time when Armenia was in the grip of Arab rule. The religious roots of this Caucasian nation run deep despite seven decades of Soviet rule that ended in 1991. 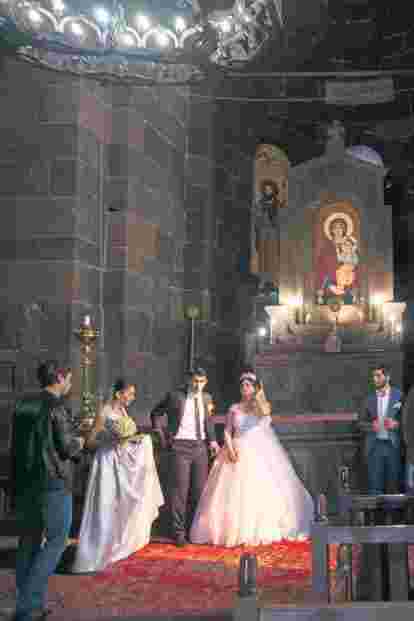 Armenia’s ancient churches are part of its living culture, where marriage ceremonies steeped in the ritual and symbolism typical of the Armenian Orthodox Church are frequently performed. This is the Hripsime Church, a seventh century church in Vagharshapat.